Code Inside Blog | CultureInfo.GetCultureInfo() vs. new CultureInfo() - what's the difference? Be aware that the given culture was “DE-CH” and the Swiss use the ‘ for the separator for numbers. Unfortunately the Swiss authorities have abandoned the ‘ for currencies, but it is widly used in the industrie and such a number should be parsed or displayed. If you don’t change the region settings in Windows you can’t parse doubles with this fancy group separator. My work machine is running the EN-US version of Windows and my tests where failing because of this madness, but it was even stranger: Some other tests (quite similar to what I did) were OK on our company DE-CH machines. After some crazy time I discovered that our company DE-CH machines (and the machines from our customer) were using the “sane” group separator, but my code still didn’t work as expected. The root problem (besides the stupid char choice) was this: I used the “wrong” method to get the “DE-CH” culture in my code. Only the CultureInfo from the first instance got the change! The problem can be summerized with: RTFM! From the MSDN for GetCultureInfo: Retrieves a cached, read-only instance of a culture. The “new CultureInfo” constructor will pick up the changed settings from Windows. CultureInfo.GetCultureInfo will return a “backed in” culture, which might be very fast, but doesn’t respect user changes. 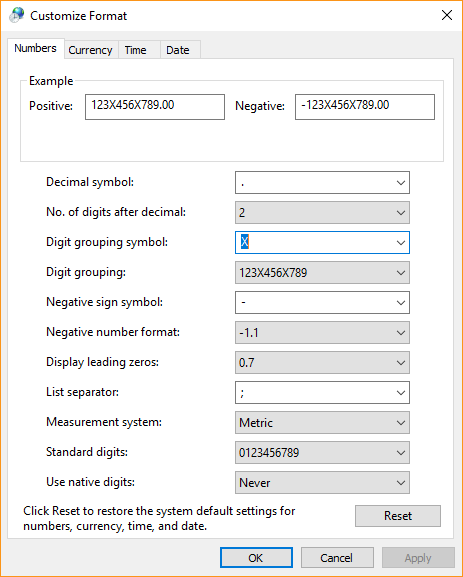 If you need to use the modified values from windows: Use the normal CultureInfo constructor.